This egg of fossilized ammonite in calcite has very rich golden-orange to deep honey-amber natural color calcite filling in the spaces between the fossilized ammonite shells. The photo at left is viewed under a single incandescent light. This 4.6 inch diameter sphere of fossilized ammonite in calcite has very rich golden-orange to deep honey-amber natural color calcite filling in the spaces between the fossilized ammonite shells. The photo at left is viewed under a single incandescent light. 6.7 inch Petrified Wood Sphere! This rare size sphere was handcrafted from a fossilized araucaria tree section with beautiful natural patterns and colors in shades of red, brown, white, gray and lavender. This petrified wood sphere was once part of a living tree in what is now Madagascar. The tree was eventually buried in sediments where over time it was replaced by silica (commonly referred to as being fossilized or petrified). See also a back-view photo. 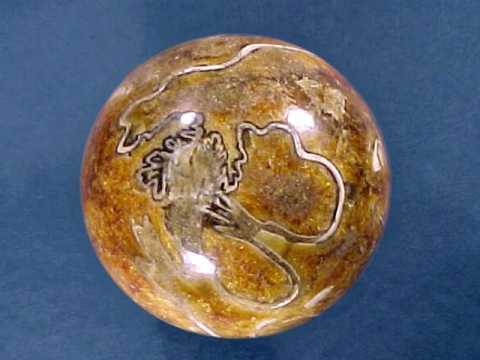 This sphere of natural fossilized ammonite in calcite has a matrix of very rich golden-orange to deep honey-amber natural color calcite with interesting patterns of fossilized ammonite shells showing the arrangement of chambers within the ammonite. The photo at left is viewed under a single incandescent light. We also carry an assortment of stands for small & medium sized spheres and eggs. This is the end of our Fossil Spheres page. 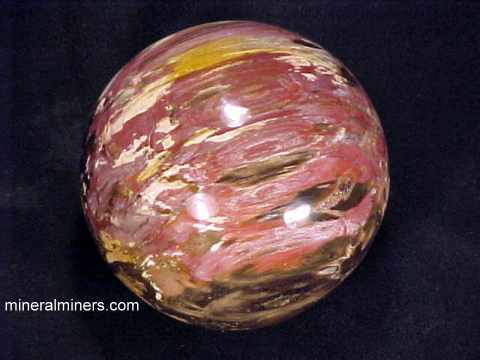 See also our genuine Petrified Wood Spheres. To see more limestone photos, just select another item category from the table below. To see photos of another mineral variety, select any item category link in our Mineral Inventory & Factsheet Index. Would you like us to inform you when we add more natural fossil spheres and eggs? We do have additional inventory of fossil items in stock, so be sure to let us know if you have any fossil spheres special requests. Please contact our webmaster or our 'site' geologist with any questions or comments.